As our regular readers already know, in 2013 Chorzów became subject to heavy controversy as the city council voted against building a new stadium for Ruch Chorzów. Perhaps most controversial of all was the reason for it: this step was advised by Ruch themselves. The club opted to relocate to the 55,000-capacity Stadion Śląski, making a new smaller stadium useless. The step was met with criticism, partly because the city had just spent months on international design competition for the stadium. 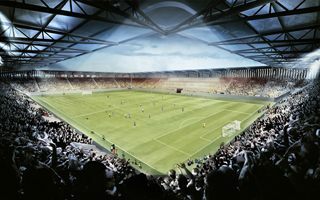 At 12,000 capacity (with room to grow by 4,000) and budget of 96 million zloty, the project was among the most sensible and cost-effective schemes among Poland’s major football cities and still was dropped by the club for the dream of playing at the country’s second largest stadium. But in mid-November the political landscape changed. Andrzej Kotala was re-elected as president, this time with majority on his side in the city council. And part of the electoral program was building what he had promised to Ruch fans. Now with support from all major factions the president is proceeding with his dream. As Kotala stressed yesterday evening, during his first meeting with Ruch supporters since his victory, the fans’ votes may have been decisive for the re-election. Despite no clear signal of Ruch’s change of heart about leaving their spiritual home, Kotala decided to press forward. After all, the city has to do something with its dated stadium, with or without Ruch. However, on Tuesday Ruch press officer Donata Chruściel gave a first sign that the club would prefer staying home rather than leaping into what many call “far too big” Śląski. “If there is a realistic plan of playing at Cicha, in the place so close to our fans’ hearts, we’re not saying no”, said Chruściel. Groundbreaking in 2015 or 2016? Chorzów already have the concept by local GMT Ltd., now detailed documentation needs to be produced before construction starts. Following first consultation with Ruch supporters, the president promised to re-evaluate capacity estimations. Instead of 12,000 expandable to 16,000, the stadium would preferably be 16,000 to begin with and 18,000 after expansion. Whether such changes will be possible within the compact chosen design is still unclear. But what may prove more important is how much such alterations might cost. Chorzów has severely limited budget and is already planning to deliver the stadium in 4 separate stages. According to president Kotala, best case scenario is building with EU or governmental support. Worst case – long term debt for the project. Either way, the stadium should see groundbreaking in late 2015 or early 2016. The phased development should realistically last until 2020.